As the Supercars championship starts to edge closer to racing at Bathurst for the annual 1000km classic, it’s tradition to indulge in some of the historic moments of The Great Race. Jordan Mulach looks back to 2006 and the start of a remarkable run across the mountain for Triple Eight. 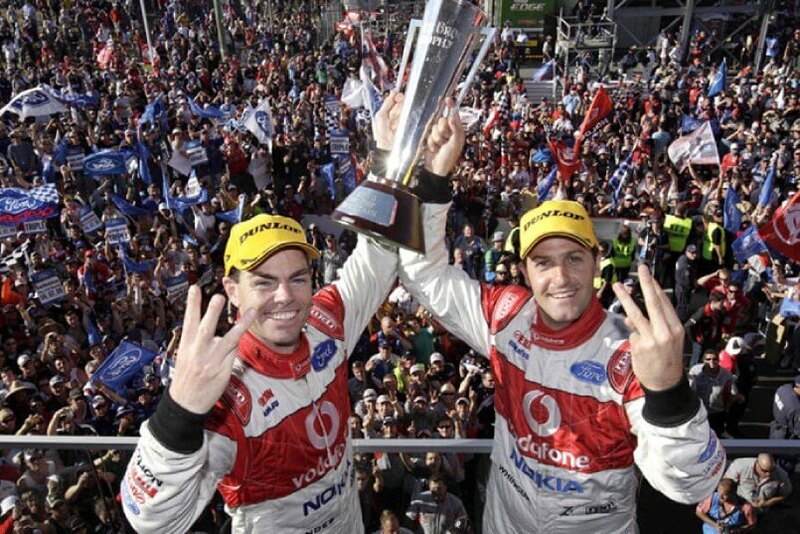 2018 marks a decade since Craig Lowndes and Jamie Whincup became the first and only drivers so far in the Supercars era to win the Bathurst 1000 for three years in a row; a miraculous achievement given the competitiveness in the category. From 2006-2008, the Triple Eight team dominated at The Mountain while they were maturing as a team at the same time, only joining the championship halfway through the 2003 season after taking over Briggs Motorsport. After a fruitless few years at Gibson Motorsport and then Ford Performance Racing, Lowndes signed up to drive for Triple Eight in 2005 and soon won the team’s first round at Eastern Creek just four events in. Finishing a close second to Russell Ingall in the driver’s championship, it was clear that Triple Eight and Lowndes were on to something good. For 2006, the team enlisted the services of Whincup in the #88 car after the young gun finished second at Bathurst in 2006 with Jason Richards for Tasman Motorsport. He proved his worth early on, winning his debut round with the team at Adelaide as Lowndes took three rounds heading in to Bathurst. The traditional pre-Bathurst 500km race was held at Sandown and won by Jason Bright and Mark Winterbottom for Ford Performance Racing, the #6 proving to be a rocket when dialled in throughout the season. Between the two endurance races, the Australian motorsport community was hit with tragedy as nine-time Bathurst 1000 winner Peter Brock was killed in a tarmac rally the week after Sandown. Ahead of the 1000, Brock was honoured with tributes at Mount Panorama as well as the winners of the race being awarded the perpetual Peter Brock Trophy. In the Top Ten Shootout, the lead #2 Holden Racing Team car shared by Mark Skaife and Garth Tander took pole ahead of the Bright/Winterbottom FPR car, with the #2 Commodore being at the shortest odds in the history of The Great Race to win. The #888 of Lowndes and Whincup could only manage sixth on the grid after struggling in qualifying and the shootout. Off the line, the Skaife car bogged down and dropped a bunch of spots as Bright took the lead into Hell Corner. Skaife’s struggles continued up Mountain Straight as the car was free-revving due to a slipping clutch, being hit from behind by Jack Perkins just over the crest, taking the #2 out of the race not even two corners in to the race. Hot track temperatures led to rapid tyre degradation, resulting in the #6 Bright car pitting early thanks to delaminating tyres. Despite being one of the quickest cars on track, the FPR car was retired on lap 28 after developing an engine drama. As the order shuffled around throughout the day, the late race battle was shaping up as a classic between the #888 and the #15 of brothers Rick and Todd Kelly. Todd came in to the race as a two-time winner in 2003 and 2004 while Rick was on a roll in 2006 as the #15 car was a jet throughout the season. Whincup and Todd battled on track in the stints near the end of the 161 lap race but the run home was between Lowndes and Rick with the #888 leading the way after the final stops, the pair separated by less than two seconds for the last portion of the race after a late race safety car. Kelly piled on the pressure to Lowndes and came within half a second of the lead but nothing would stop the series veteran from taking his second Bathurst 1000 on the day the paddock said farewell to his mentor, Peter Brock. While the Kelly brothers were gutted at finishing second, Rick had the last laugh as he was crowned champion in controversial circumstances over Lowndes at the end of the season. Lowndes and Whincup’s Bathurst preparation got off to a flying start in 2007 as the pair won the Sandown 500 ahead of their old foe Rick Kelly. The #888 duo went to Bathurst with high hopes of a good result, wanting to get Whincup up into the title fight. Qualifying sixth with Lowndes behind the wheel, the #888 qualified behind championship rival Garth Tander in the #1 car with Rick Kelly as Mark Winterbottom and Steven Richards in the #6 FPR car took pole for the race. It looked like a close battle between the #6, #888, #17 of Steven Johnson and Will Davison plus the #25 of Jason Bright towards the end of the race as the #1 car was retired due to ongoing brake dramas on lap 134. Whincup handed over the reigns of the Team Vodafone car on lap 133 to Lowndes, almost throwing it all away at pit entry when he locked the rears and had to fight to get the car out of the gravel trap. Winterbottom nearly had a monster crash on lap 148 as he lost grip entering The Chase, having a tankslapper and launching the FPR Falcon through gravel, popping up in front of Lowndes who only just avoided drilling the car. The next lap saw drama at the top of the mountain as Bright drifted wide approaching McPhillamy Park, hitting the wall with Russell Ingall and Mark Skaife behind followed. 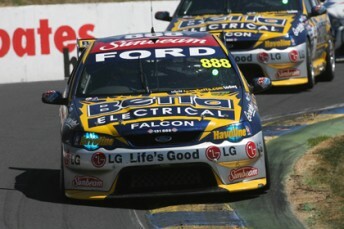 A safety car bunched up the field as the battle to the flag involved Lowndes, Johnson, Greg Murphy and James Courtney. Despite Johnson passing Lowndes, the defending winner got back past on the next lap as Courtney muscled his way in to second in front of Johnson. The order remained the same until the chequered flag, giving Lowndes and Whincup their second win at the 1000 in a row and sweeping the endurance season in the process. Tander ended up winning the 2007 season over Whincup despite the massive drop in points due to retiring from Bathurst though Whincup would get his own back at the start of 2008, winning the Clipsal 500 for the second time and Sandown, now a sprint round due to Phillip Island taking away the pre-Bathurst 500km race. While Tander and co-driver Mark Skaife won the Phillip Island event on track, it was Lowndes and Whincup who won it in terms of round points accumulated through the qualifying races, again showing their prowess in the season’s longer races as they rolled up to Bathurst. Yet again, the #888 didn’t start from pole, this time securing fifth in the top ten shootout while the Tander/Skaife car came out on top in the shootout, taking pole from Winterbottom and Richards in the FPR Falcon. Tander stalled his Commodore off the line while also jumping the start, earning himself a 10 second penalty in the car’s first pit stop. Lowndes fought hard in the opening laps to bring the #888 up to second behind James Courtney for Stone Brothers Racing. For the second time in three years, tyre delaminations started to hamper the field early on in the race as teams started to catch on to the failures. The stints of the field between stops were shortened and made dependant on tyre life rather than fuel load. A slow puncture for the #4 Courtney/David Besnard car slowed them down in the second stint as Whincup took advantage to move into the lead, opening up a gap to the field ahead of the race’s first safety car on lap 73. Though the car showed superior speed, when Lowndes jumped back into the car he was buried back in 17th, far back from the front where they wanted to be. Skaife bent the Holden Racing Team car in the second half of the race, making contact with the wall at Forrest’s Elbow and dropping the pole-sitting car back down in the order. In his final full-time season, it was clear that Skaife didn’t have the same speed which had taken him to success earlier in the decade. As the race came to a close, Lowndes led the way from Richards, Greg Murphy and a hard charging Courtney in the final ten laps. Murphy had pace over Richards but couldn’t work his way past, giving Lowndes a good gap before he could finally get into second on lap 158. Courtney soon made it past Richards for third as Murphy hunted down Lowndes, closing at a great rate of knots but he couldn’t get close enough, allowing Lowndes to take his third win at Bathurst in three years with Whincup, completing the Triple Eight three-peat. With their historic Bathurst 1000 three-peat, Lowndes and Whincup are the only drivers in the current Supercars era of Australian touring car racing to do such a thing at Mount Panorama and the only duo in history to take a hat-trick for Ford. Lowndes followed in his mentor Peter Brock’s footsteps by taking three wins in a row in the Bathurst 1000 after “Peter Perfect” won in 1978, 79 and 80 with Jim Richards and then 1982, 83 and 84 with Larry Perkins. Both Whincup added another win at The Mountain to his resume in 2012 with Paul Dumbrell while Lowndes notched up two more victories in 2010 with Mark Skaife and 2015 with Steven Richards, meaning he has won the Peter Brock Trophy more times than any other driver with five victories. As the countdown to race week begins, Whincup is in good form after dominating the Sandown 500 this year with Dumbrell while Lowndes is looking to sign-off from his full-time racing career in the best possible way by taking another win in Bathurst, again paired with Richards. With talk of Lowndes pairing up with Whincup again for the endurance rounds, could we see the dynamic duo take another Bathurst 1000 crown together?